For five years in a row the gardens won a Green Flag Award for being one of the best community gardens in the country. Unfortunately, the Friends of Greenhill Gardens website is a little unclear about which five years were covered by the awards, but it must have been very recently. a giant floral clock, installed in 1936.
an 18 hole putting course overlooking Weymouth Bay. a wishing well, from which coins are collected and donated to charity. four tennis courts that residents can use for no charge in winter months. 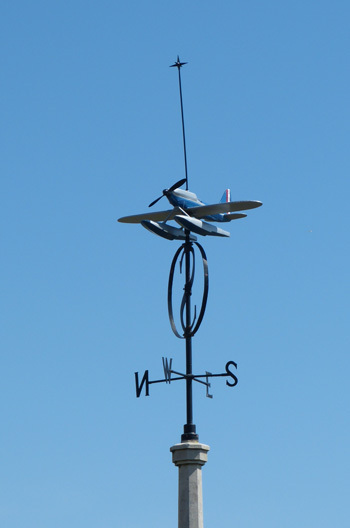 The Schneider Trophy weathervane which commemorates Lieutenant George Stainforth’s successful attempt on the world air speed record in 1931. Stainforth had been a student at Weymouth College. The Friends of Greenhill Gardens (FOGG) organise a variety of entertainments in the gardens, having installed a bandstand in 2013. The popular music events held during the summer are entirely free to attend. In 2015 they included performances by Tony Lowe, The Silhouettes and Weymouth Ukeleleans. If you’re looking for refreshment there are two cafes in the gardens, both offering fantastic views across Weymouth Bay. FOGG have installed a raised bed which has been planted as a sensory garden, for the benefit of visually impaired visitors.